Imparts an attractive new appearance to tyres and rubber parts on showroom or covered display. Suitable for use in car wash bays when tyres may be initially wet. Apply with brush or sponge. For water or weather resistant finish use Rubber Cleaner. 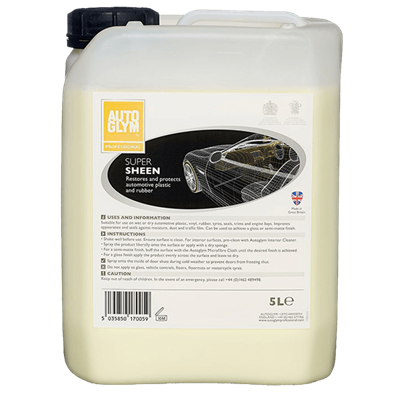 Autoglym Super Sheen 5ltr conditions and protects plastics, vinyl, tyres, seals, leather and trim.